A few years ago I had to make a few appetizers on a very tight budget. I really wanted to make a Goat Cheese log but my tight budget did not allow it. So I decide on the next best thing: Cream Cheese. I love love LOVE cream cheese, so to me this was the next best option. Much to my surprise it was well received and people really enjoyed it. Fast forward to Thanksgiving last year. For once I was not cooking and I all I was instructed to do was to bring some kind of appetizer. 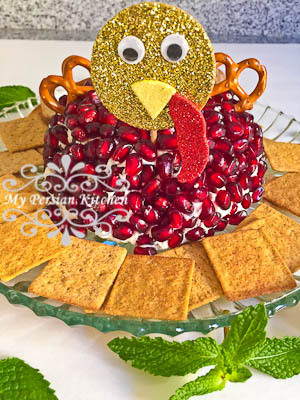 For a while I had been coming across a super cute cheese ball which has been decorated as a turkey while browsing through Pinterest. It only made sense to make said cute turkey cheese ball to take with me. Instead of following the recipe, I simply made a ball out of cream cheese then rolled in both cranberries and walnuts. Much to excitement people kept on raving about how good it was! Fast forward to a little while ago and once again while surfing through Pinterest I came across a pomegranate cheese ball. Of course I was immediately intrigued and knew that I was going to come up with my own version for this year’s Pomegranate Week. Since I have had much success with my beloved cream cheese, there was no point in experimenting with other types of cheese. Nope! 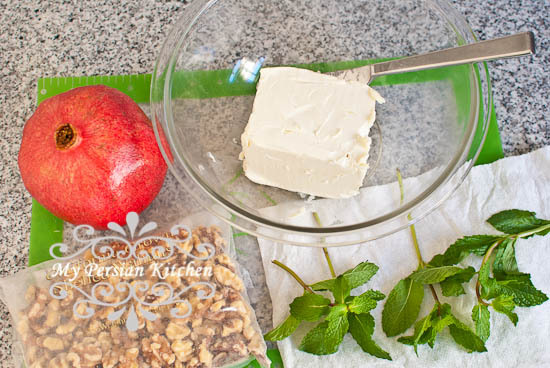 I set out on playing with only 4 ingredients: cream cheese, walnuts, mint, and pomegranates. I made my cheese ball and took it with me to work to share it with some of my fellow instructors. I was super excited to see how well received the Pomegranate Cheese Ball was! I hope you will enjoy it as much as the rest of us have so far!!! Before I begin, I feel that I should share a piece of advice. 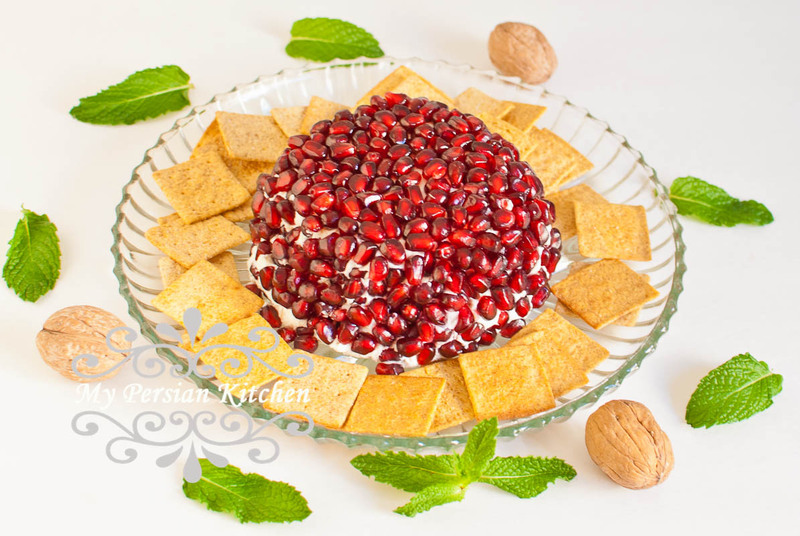 Truth be told, for this appetizer to be over the top good, it’s best that the pomegranate arils are the type that the seeds are soft and can be easily swallowed. Now, onto the recipe! First things first, remove cream cheese from fridge and allow to come to room temperature. This should take about one hour or so. 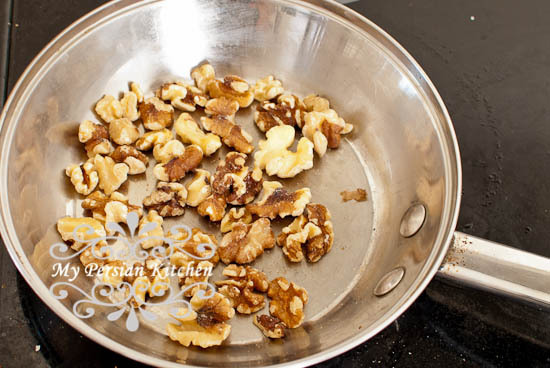 Roast walnuts until the aroma rises. Spread on a cutting board and allow to come to room temperature. 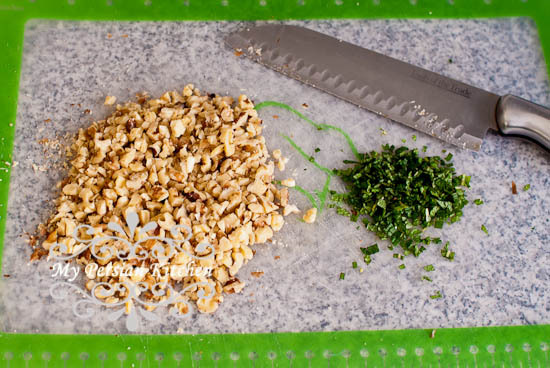 Fine dice walnuts and fine chop the mint. 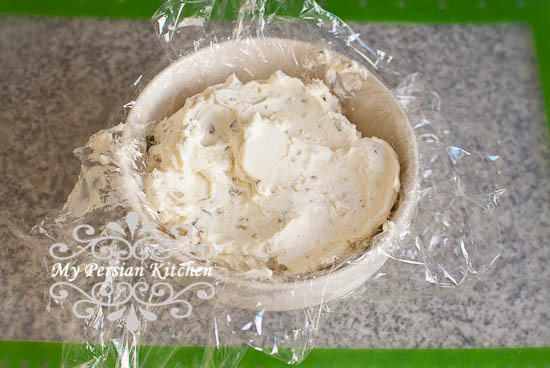 Add one half of walnuts and mint to cream cheese and mix well. Then add the remaining half and mix well again until all well incorporated. Line a bowl with plastic wrap then place the cream cheese mixture in it. Enclose the plastic wrap around the cheese then remove from the bowl. Gently form the cream cheese into an round ball. Press the ball onto the cutting board gently so that the bottom is flat. 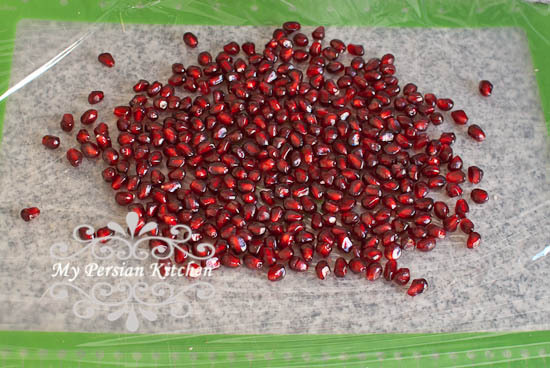 Place a large piece of plastic wrap on a cutting board and spread out the pomegranate arils in a single layer. 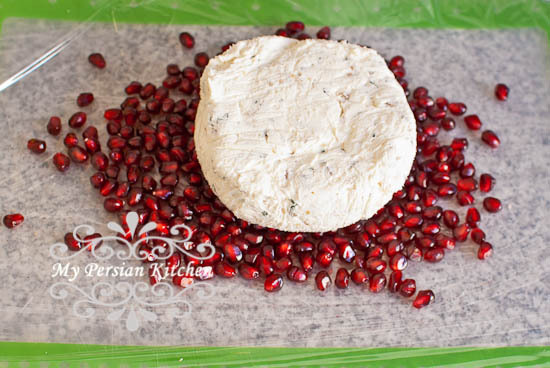 Gently place the round part of the cheese ball on top of the pomegranates and roll around. Use your hands to gently press the seeds onto the cheese. It’s important to be very gently during this process so that pomegranates stay intact. 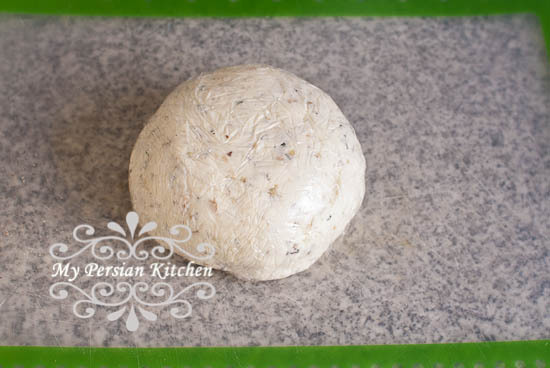 Gently wrap the paper wrap around the cheese ball and place in the refrigerator for at least 2 hours before serving. Serve cheese ball with your favorite crackers. I highly suggest serving the cheese ball the same day that you make it so that the pomegranate seeds look nice and fresh. 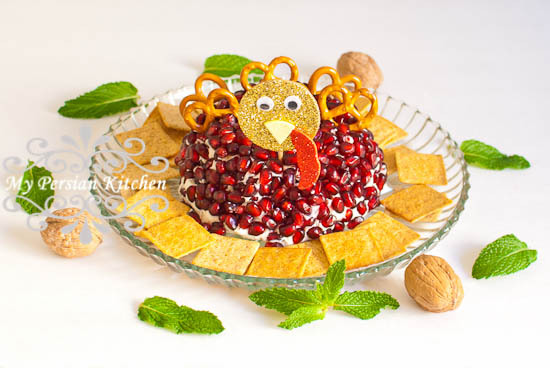 In case you want to serve this Pomegranate Cheese Ball for Thanksgiving, simply decorate it with a little turkey head and a few pretzels on its back. I think he is super cute! Remove cream cheese from fridge and allow to come to room temperature. Roast walnuts until their aroma rises. Spread on a cutting board and allow to come to room temperature. Fine dice walnuts and fine chop mint. 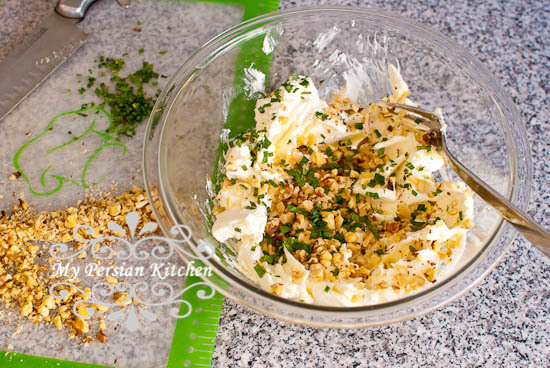 In a bowl combine cream cheese and half of the walnuts and mint. Mix well. Then add the remaining half and mix until well incorporated. Line a bowl with plastic wrap. Place cream cheese mixture inside. Enclose plastic wrap around the cheese and remove from bowl. Gently shape the cheese into a ball. Place on a cutting board and gently press down so that the bottom is flat. 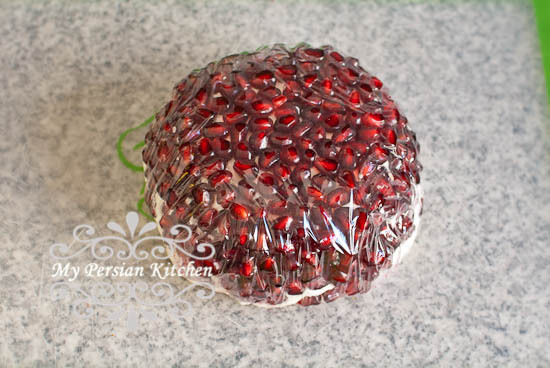 Place a large piece of plastic wrap on a cutting board and spread out the pomegranates in a single layer. Gently place the round portion of the cheese ball on top of the pomegranates. Gently roll around. Use your hands to gently press the arils onto the sides of the cheese ball. Gently wrap plastic wrap around the ball and refrigerate for at least 2 hours. Thanks. It is great for Yalda. I will make it and I’m sure we’ll enjoy it.